That blazer is just adorable! Thanks! I bought it years ago- and it has proven to be a great, versatile piece! This outfit is one of my all-time favorites! Oh Jenny- it’s so good to hear from you again! I was thinking about you the other day- wondering how you are doing and realized I hadn’t heard from you in a while! Thanks so much for commenting! Hope life is good for you! Love the blazer – you are so right, changing one thing can make a huge difference! 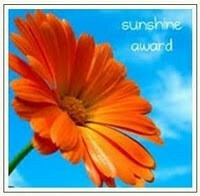 You are right about the sunshine today – at least you have the award to brighten your day! Hey ! Just popped over for ideas for tomorrow & saw my name, THANKS ! Funny, I have something in the works for you as well, should be done by end of the weekend…. You do make me laugh everyday! Thanks for that! The blazer is co chic. Express really? What a find. Thanks for sharing on Monday Mingle. Sorry- the tank is from Express! The blazer is from White House Black Market! Great blazer and really LOVE your necklace!! Congrats on the award and thanks for leaving me a comment today. The blazer is really pretty and you are right the chains gives it edge. FYI when I click on your profile it has your blog link linking to a non active blogger blog. I still found it in your description but thought I would let you know. I’ll make sure to check out those other blogs #10 has me just at it!s name. it was a rainy day here too!! Love your jacket! !